In my last blog, I quibbled about the logistical and parking issues that Washington D.C. poses to the suburbanite who wants to venture into town for a decent meal, hence my lack of blogs on its eating establishments as of late. After posting a photo of my meal at my favorite Indian eatery on social media, a friend of Indian descent invited me to join him for a meal at his favorite spot serving the same South Asian fare. Having not heard about that locale and realizing that it was in a quiet neighborhood, I decided to met up my friend and his lover, as well as another couple, to sample their offerings. Chicken Saag, Pumpkin, Mushroom, Okra, Cauliflower. 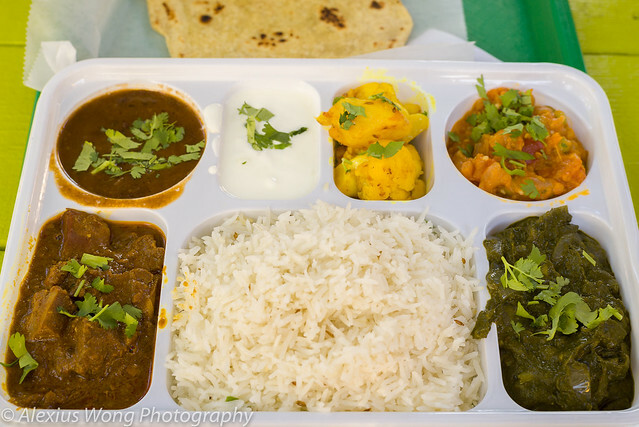 Lamb Curry, Gobhi, Eggplant, Saag, Daal. Goat Curry, Cauliflower, Okra, Eggplant, Pumpkin, Flat Bread. The Chicken Saag was a combination of tender pieces of chicken that tasted well-seasoned due to a marination, paired with a silky smooth puree of spinach that was devoid of any bitterness, spiked by a good dose of fresh ginger that brightened the mix as well as providing some spice heat. This dish was very sumptuous and one of the best versions that I have tasted, making me return to it continuously. The Goat and the Lamb Curries had pieces of tender meat, an indication that they were stewed long enough in a sauce similar for both meats, but without falling apart due to some skillful timing in the kitchen. The tomato-based sauce was perfumed with the proper spice mixture that was well-balanced as not to overwhelm the natural meat flavors that managed to assert their presence without any extraneous gaminess. As for the Chicken Tikka, I did not manage to be presumptuous enough to poke my fork into a newly-made acquaintance’s plate, but he seemed rather satisfied evidenced by the few morsels left at the end of the meal. All the orders came with a copious amount of Basmati rice that was light and fluffy, seasoned with salt (which some establishments omit, unfortunately), studded with whole cumin seeds, and was made healthy with ribbons of fresh spinach. The Cauliflower came in large whole pieces that were not overcooked, seasoned with cumin, tomato and a good dose of turmeric judging by its rich yellow hue. The Okra was still al dente and surprisingly not slimy at all, paired with some sautéed onion and fresh tomato, reminding me of the Southern-styled preparation. The Mushrooms were quite firm and meaty, cooked in a tomato puree sauce, tasting spicy with chili heat, and fragrant from cinnamon, making it a very appealing hit for this mushroom lover. The Pumpkin was surprising not sweet like most other preparations, but it had notes of squash along with chili heat, spiking ginger, and onion sweetness. 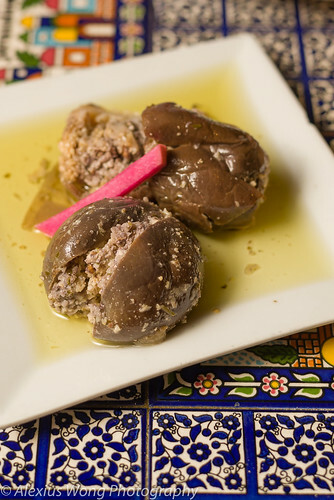 The Eggplant was wonderfully smokey, vegetable sweet, and silky smooth, reminding me of a properly prepared babaghanouj which made me return my fork often into my friend’s tray. The Daal Lentils were cooked until very smooth and spiced with woodsy spices without overwhelming the legumes. The Cabbage was cooked without any mushiness and made interesting with anise seeds, and garam marsala, with some chili heat that produced a back throat burn. The Raita was quite thick for a yogurt sauce, tasting much creamier than the usual kind, quite salty, and having thin cucumber strands running though it, which became the perfect relieving foil for all the spices and heat in the other sides and meat courses. The flatbread was not the usual fluffy Pratha or Naan Bread but more a wheaty textural bite that reminded me of Chapati bread or the Tamil-style Tosai. My friend was right, and thankfully so, to steer me to this place. 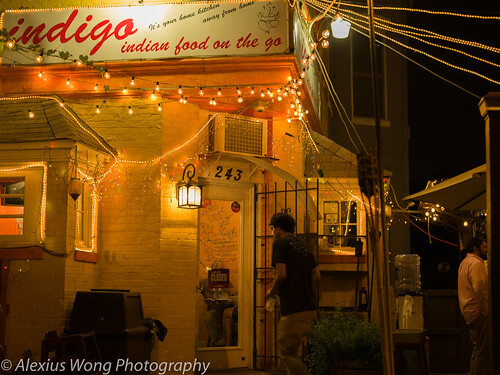 What Indigo offers is what superb Indian food is all about: interesting and differentiated spicing (not a monolithic seasoning approach like some inferior establishments practice), freshly cooked dishes with equally fresh ingredients (not reheated tired leftovers), and a good variety of dishes to accommodate the knowledgeable diner. 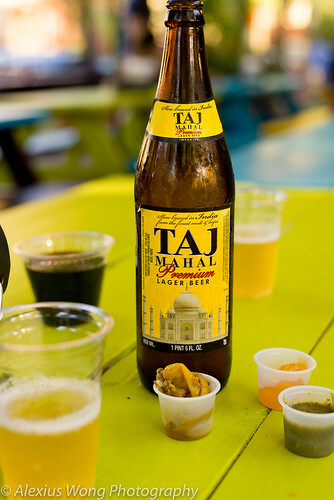 What I tasted that night exemplified the above qualities, which made the experience satisfying on many levels and pleasing to this diner who has found an Indian establishment in the city, albeit not downtown (a relief), worth mentioning and with high praises. The place’s funkiness has a wonderful charm that makes good food the great equalizer, with the garden furniture making no distinction whoever sits on it to enjoy their meal. Indigo is a great find indeed which deserves my many future repeat visits. 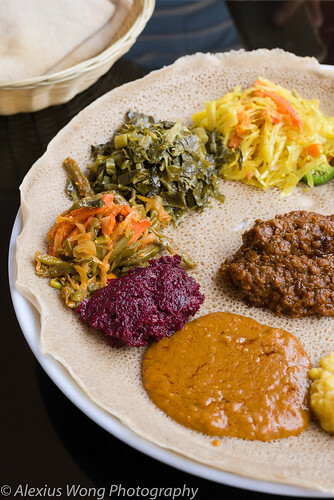 Ethiopian cuisine poses a few challenges on different levels. 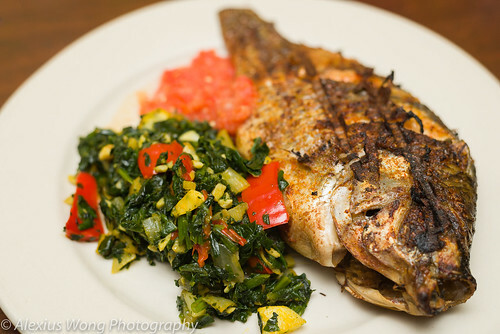 First, there is a plethora of restaurants serving this fare due to the influx of immigrants from that East African region resulting in a boom of restaurants beginning from the 1980’s. With so many to choose from, it has been a challenge for me to pick a place to write on. 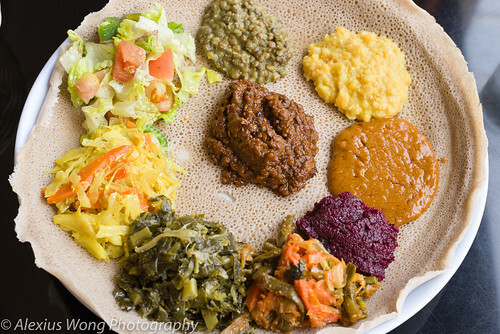 The other issue is that Ethiopian food, especially the spongy injera bread, creates a textural challenge for most Americans who tend to steer away from this soft or mushy feel especially when eaten customarily with the bare hand. With this said, I have problems finding enough friends to join me to partake in this type of meal. But last weekend, I managed to corral a couple of die-hard friends for this rare treat. 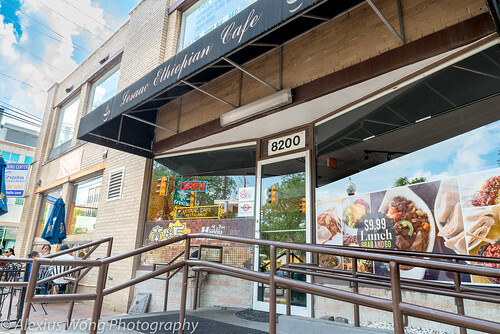 Downtown Silver Spring, MD has taken a transformation the last few years, and it has become the hub of Ethiopian gastronomic and social life judging by the high number of such establishments dotting its square blocks. When I noticed an online offer for Lesaac Ethiopian Cafe, I knew I couldn’t bypass such a deal especially from an establishment in that area. 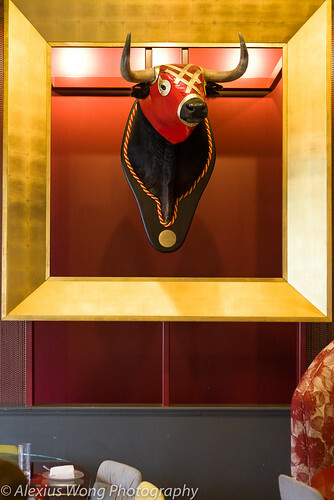 Walking through its doors, you notice the strong rich colors on the walls, the photo mural on the ceiling and vibrant tile work on the wall, all decorating the booths and tables in the rather narrow shotgun space. I was tempted to sit outside on its sidewalk patio, but with a friend suffering from seasonal allergies, we chose to go inside instead. 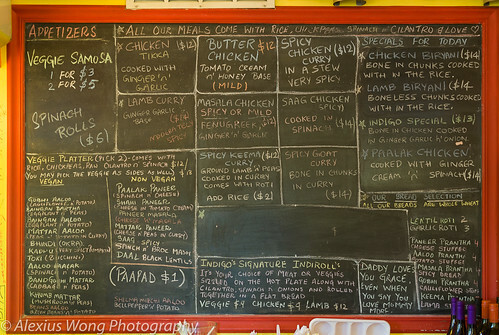 Having savored Ethiopian food a number of times over the years, I have got familiar with some of their regular dishes. Cooked vegetables stand out in this cuisine, and we ordered the Lesaac Veggie Deluxe. 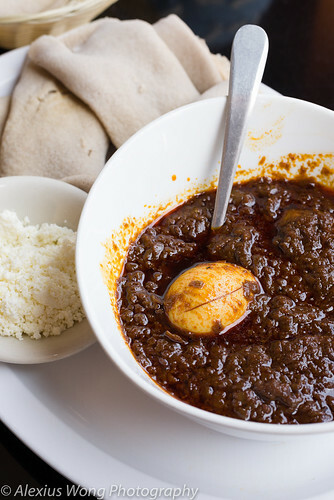 What arrived was a large platter layered with the sourdough injera bread topped with nine bean and vegetable dishes. The collard greens tasted quite savory and were not too mushy but cooked well. The red beets were a novelty for me since I never encountered them in this cuisine: they were naturally sweet, tasting slightly earthy, and enriched by some butter that took them to another level. The Yellow split peas were well-seasoned and also well-cooked, cooked to a level of doneness without being mushy. The same level of doneness were the red lentils that were mixed with some Berbere chili paste and tasted a bit tangy, which made them interesting. The green beans and carrot were cooked well-done without being too soft and tasted vegetal sweet and garlicky. The salad was really tangy and salted from a vinaigrette made of citrus juice and herbal seasoning, making it a palate cleanser in between bites. The cabbage was soft, naturally sweet and quite garlicky. The green beans were quite mushy, slightly under seasoned and reminded me of lentils. The middle mound of red split peas was a puree seasoned with a smokey spicy concoction. 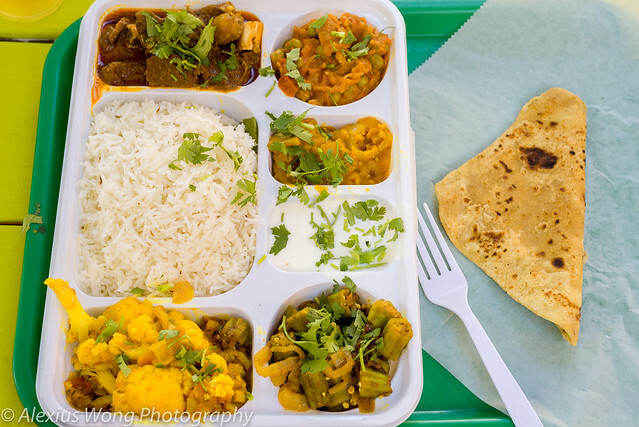 With such variety in offerings, flavors, textures, and seasoning, my dining friends and I were in hog heaven with this dish that tasted the best that I have ever savored, and I could have been perfectly content indulging on this vegetarian platter. 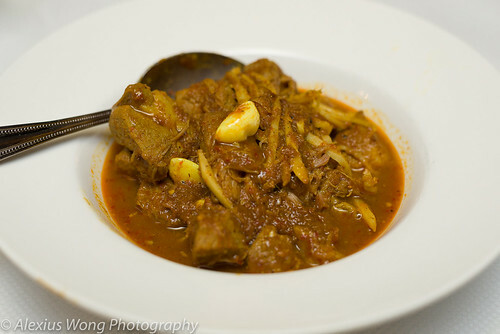 Another recognized dish from my foray into this cuisine is a popular one – Doro Wat. The bowl arrived with a heaping amount of thick sauce covering a lone piece of chicken and boiled egg. One taste of the sauce put everything into perspective. The customary scant piece of chicken with the lone egg always perplexed me with its small portion of protein. But this time, I realized what this dish was really about – the sauce. It tasted smokey and spicy from the Berbere chili powder, rich from butter, and quite sweet from a copious amount of onions. In addition, there was a slight burn after each bite coupled by a mild tanginess from the dried peppers, which made the sauce totally irresistible and reminding me of good Mexican molé sauce. The side of crumbled cheese was interesting since it was devoid of salt or cheese pungency, but it played a minor role of adding more richness and making the spicy sauce milder to the palate. The side of injera bread was the perfect vehicle to mop up all the goodness, which I would have done so if weren’t for the other dishes. Finally, I have savored a damn good version of this famous dish which has revealed its real gastronomic truth to this diner. For my pescatarian fellow diner, we order Fish Gulash upon the waitress’ recommendation. The large bowl arrived with pieces of fish covered by a rather thick red sauce and studded by bits of jalapeño peppers. The bits of fish were mild tasting and a bit crispy from some frying, covered with a slightly tangy tomato-based sauce made sweet with lots of onions and spiced by the peppers. My fellow diners raved about this dish for its fresh tasting seafood, confirmed as fresh tilapia (surprise! ), and the bright tasty sauce that married well with the fish. The side of salad was a bright mix with a tangy vinaigrette that was the perfect companion to this dish. 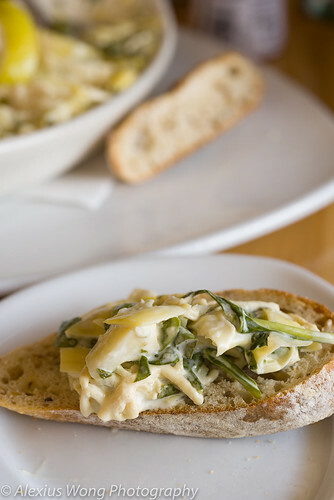 This was definitely a hit with us and I’m looking forward to savoring this new dish again. With some credit left on the coupon, the waitress suggested an item from the breakfast section – Meat Omelet. The omelet arrived with some toast to complete the meal. 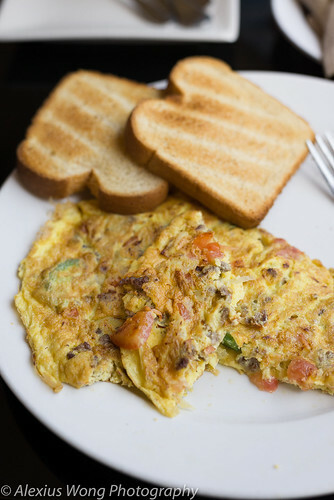 The egg mixture was quite savory with pieces of slightly seasoned and tasty beef, mixed with onions, green peppers, and tomato that lent their vegetal sweetness, tanginess, and slight crunch that made each mouthful interesting and comforting. The egg was a bit firmer than the usual French version, but it was nearly greaseless and something that I enjoyed after having eaten egg cooked this way growing up in Asia. This dish would be an order when I’m in the mood for some Ethiopian breakfast. Finally, I have found an Ethiopian restaurant that I could say really justifies what this Eastern African cuisine is all about. 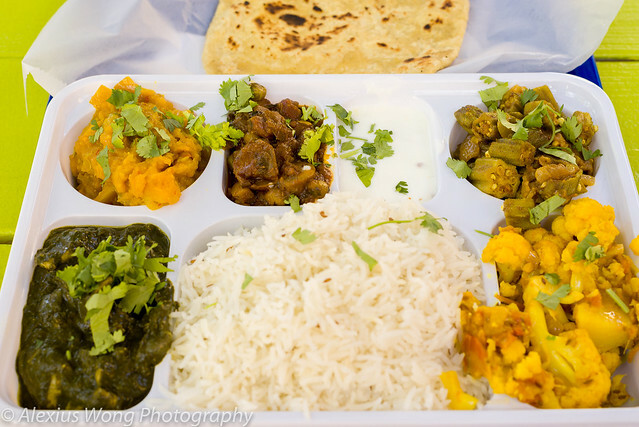 The Veggie platter blew us away with the variety of vegetable dishes with their freshness, flavors, and cooking. 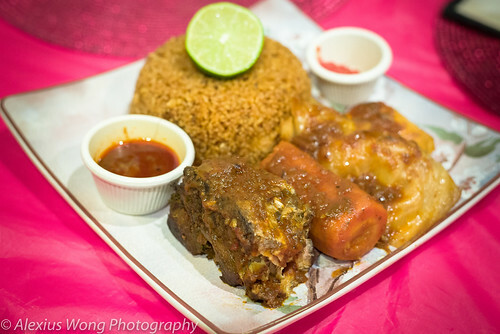 The Doro Wat dish was completely revelatory for me with the secret being the sauce, and I waited all these years to savor a version that spoke volumes to me. 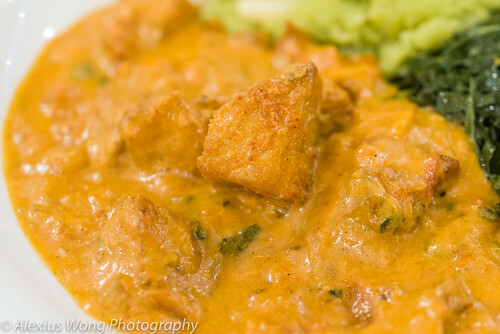 The Fish Gulash was definitely another hit with its mild sweet fillets covered by a savory bright sauce. For breakfast, I would not hesitate ordering their Meat Omelet that was both comforting and satisfying. With food this good and definitely authentic, judging by the nearly all Ethiopian clientele (interestingly nearly all male, but a cultural norm), this is another new-find and a favorite locale for this cuisine. 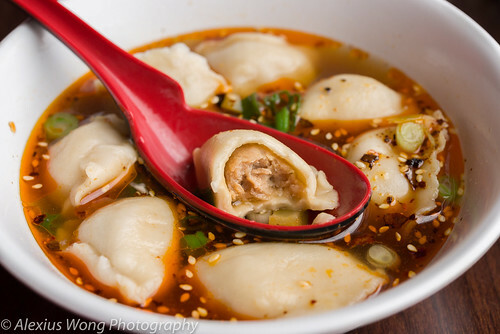 Finding veritable Chinese cuisine in the DMV is as challenging as locating an endangered species. 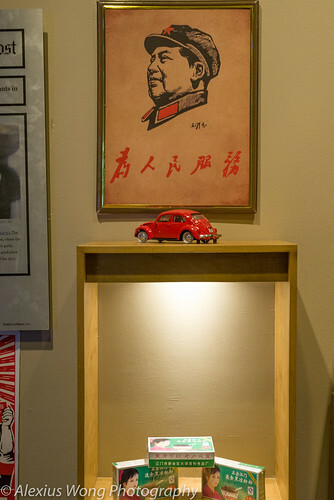 I attribute that to two causes: the long history of Chinese-American food that was introduced by Chinese immigrants in the West Coast at the turn of the 20th century, and the lack of demand for authentic Chinese cuisine until recently with the tide of immigrants from the Mainland. In the last couple of years I have come across establishments serving fare that would satisfy the truth-seeker culinary wise. Recently, I read that there was a small hole-in-the-wall in my old college neighborhood, College Park, MD, serving regional Chinese food. 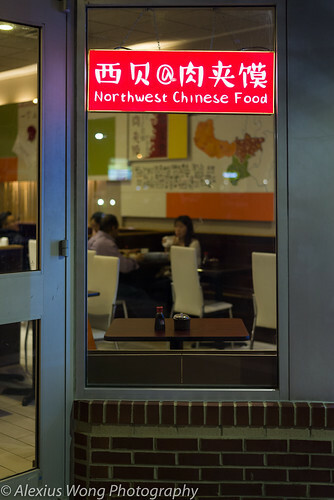 Northwest Chinese Food (name lacks originality, but not culinary confusion) is located on the main drag sandwiched by other eating establishments that are desperately calling the hungry students’ attention to walk through their doors. 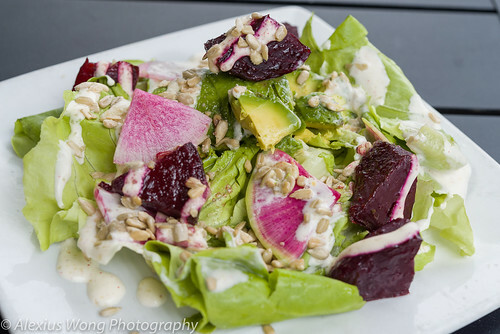 I paid it three visits for this review, and I was lucky to have a table by the window for the photo shots despite it’s busyness and the cramped space holding only 9 tables. This place has garnered lots of online reviews and recommendations, and with that list in hand I placed my first appetizer/opener. Black Vinegar Peanuts was frequently mentioned and high on my list too. The plate of nuts arrived with skin intact swimming in a pool of black sauce. One bite revealed the dish’s nature. 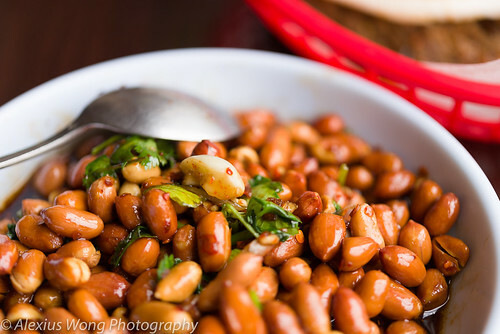 Toasted peanuts were punchy to the taste, made even more aromatic by pungent raw garlic and herbaceous cilantro, spicy by red chili flakes and finely julienned ginger, and picked up by a slightly earthy black vinegar that reminded me of good Balsamico. These nibbles were highly addictive and we couldn’t stop serving ourselves of it despite the other ordered dishes and the dish’s copious amount. The other highly raved dish is Shredded Potato. This vegan dish sounded and looked unique at first glance. The plate was filled with very finely shredded pieces of white potato that has been marinated in a sauce. The matchstick slivers had a most interesting texture, tasting barely cooked, yet exuding a crunch that would suggest it being raw and reminding me of Asian radish. But it was the seasoning that elevated this lowly tuber to an ethereal level, tasting spicy from the chili sesame seed oil (also served at the table), fragrant cilantro, raw garlic, and a hint of vinegar to counteract this starch. I was quite blown away by this simple dish since its treatment and flavors hit all the right spots. 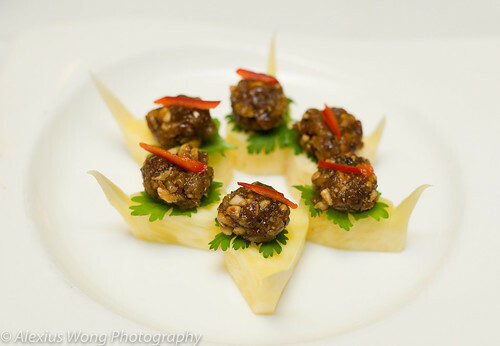 Another appetizer that looked like a dish I had savored before was Sour Soup Dumplings. The bowl arrived with these stuffed pasta floating in a bowl of broth. However, they tasted quite different from the Shanghainese version that I was used to. 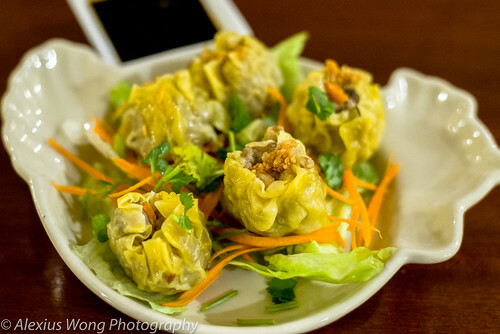 The dough was thicker than wanton skins but the stuffing was the same aromatic and moist finely minced pork mixture. 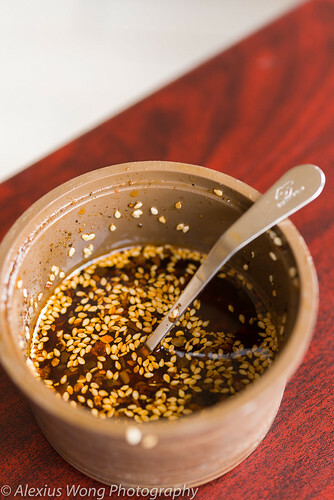 It was the broth that took it in an interesting direction with a mild savory flavor spiked by some chili sesame seed oil, made sour by pieces of pickled mustard green, and some body added by chunks of raw garlic. There was a soulful element to this dish that did not taste stodgy or passé, and it can definitely make a complete dish by itself. Skewers seem quite popular among the reviewers and other customers during my stopovers. On my visits, I tried the ones made with beef, with lamb, and with chicken. The sticks came filled to the brim with thin small pieces of meat. 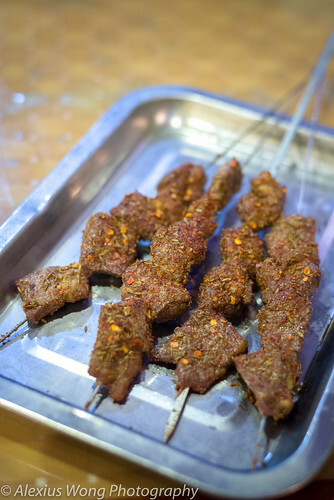 All the meat versions (a couple of non-meat versions are offered too) were seasoned with the chili sesame seed seasoning and whole cumin seeds. The bites were quite spicy and aromatic from the seasoning and spices, but they lacked some salt. Their slight oiliness indicated that they were cooked in oil, but I was missing the grill char that would have made them more interesting and flavorful. As for the cuts of meat, the lamb was a bit tough, but the rest of the meats were quite tender to the bite. As small bites, they were not bad though. 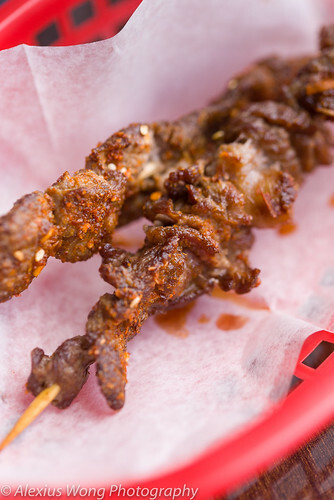 Along the same line as the above skewered meat are the burgers, and I tried the Spicy Cumin Lamb Burger on one occasion. The sandwich arrived in a basket laced with sandwich paper. 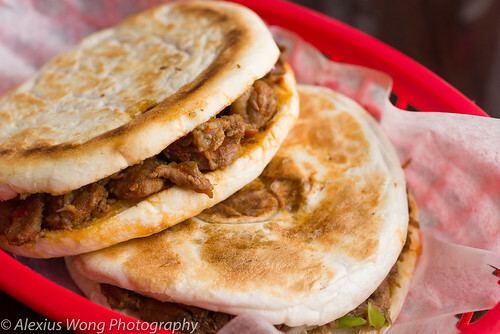 The bun was a flat unleavened bread showing its in-house quality and reminding me of a thick pita bread, an indicator of the Muslim influence in that part of the world. Its stuffing was dripping with grease, unfortunately, but one bite into it detracted me from its flaws. The meat was chopped up from whole pieces, tasting very spicy from chili flakes and very aromatic from toasted whole cumin seeds that immediately perked the senses up. After allowing some more of the grease to drip out of the burger, I was enjoying every bite while relishing its flavors and textures. The beef version was much less greasy, as well as spicy, coupled with some sweet vegetable elements of red onions and green peppers. Hey, after all, “burgers” are meant to be greasy, and this is my new find of this type of handheld food. 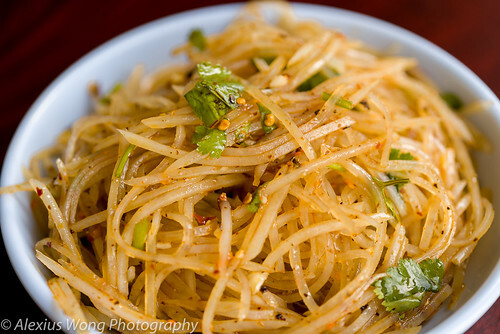 This place is known for noodle dishes from that part of the world, especially hand-cut noodles. Since it was getting rather warm from the strong Spring sun, I ordered Sesame Sauce Rolled Noodles. 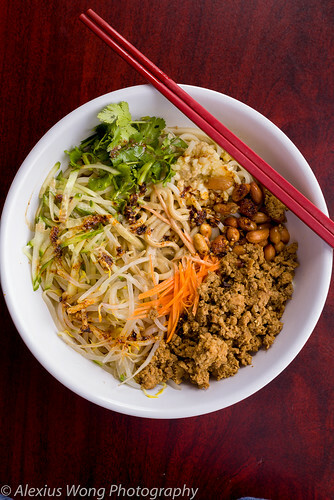 The bowl arrived with the disparate elements arranged in their areas, reminding me of Vietnamese Bun Noodle Salad: cucumber, bean sprouts, finely shredded carrot, cilantro, peanuts, raw garlic, all sitting on a mound of wheat noodles lathered with sesame sauce and the chili sesame seed oil. One swirl and a chopstick full immediately perked my interest. All the ingredients contributed their flavor element of spiciness, nuttiness, herbaceous quality, garlic pungency, cooling quality, along with different textures that made each bite quite a kaleidoscope. The sesame sauce was the perfect liaison that added its tahini-like creaminess with a hint of vinegar that elevated the noodles that were perfectly al dente and tasted handmade, akin to Spaghetti alla Chitarra. This vegan dish comes without protein, but I added a topping of minced pork that was moist and made fragrant from the use of Asian cinnamon (cassia) exuding a faint note of enticing licorice to the protein. This is the perfect summer dish in the next few months, and I will be planning to order it then, vegan or not. 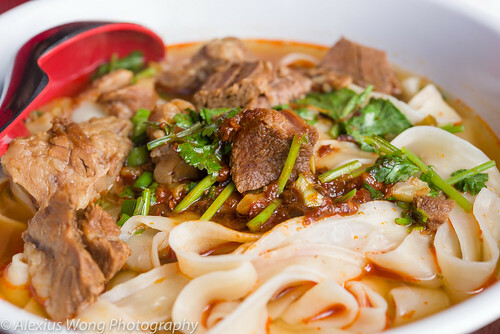 One of the most mentioned dishes online is Spicy Beef Noodles, and it is one that I recognized from this region due to my addiction to food and travel programs. The bowl arrived wafting with an enticing smell and immediate appeal. The soup, like most noodle soup dishes, is the key to the success to any dish of this kind. This version had a body, probably from beef bones, made aromatic with hints of star anise, spiked by the mouth-numbing Szechuan peppercorn, and it carried sour and salty notes from the pickled mustard green. The beef chunks were amazingly sumptuous with its tender and fall apart quality, tasting more seasoned than the soup due to its cooking apart from the stock, which added to its appeal. Additionally, the rice noodles had an al dente quality that did not turn mushy throughout the meal, reminding me of well-made fresh egg pasta. The pool of chili condiment (not the table type) added some extra zing to the whole mix but still made it quite palatable. 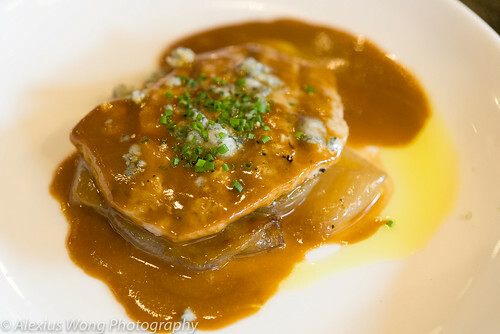 I could not get enough of this dish as it was exciting both flavor and texture wise. This soup noodle has now been added to my eating repertoire of this genre. 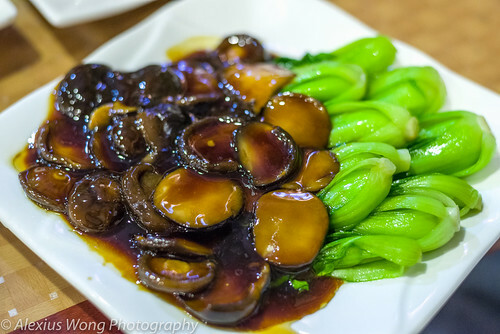 Northwest Chinese Food has become one of the most exciting discoveries for me on this gastronomic journey. Partly it is because this is newfound territory, and also because this regional food is exciting and downright delicious. This excitement was found in the flavors in nearly all the dishes especially the peanut dish, shredded potato salad, the lamb burger, and both beef soup and sesame sauce noodle dishes. In addition, the wheat and the rice noodles that I savored had a texture that I have never tasted in other Chinese establishments due to their hand-made quality and perfect cooking treatment. Yes, the place is small and quite crowded on certain days, and I was even scolded by a waitress for holding a table while I waited for my party – typically Chinese. But with food this exciting and quite mind-blowing, such inconveniences can be tolerated or even overlooked. 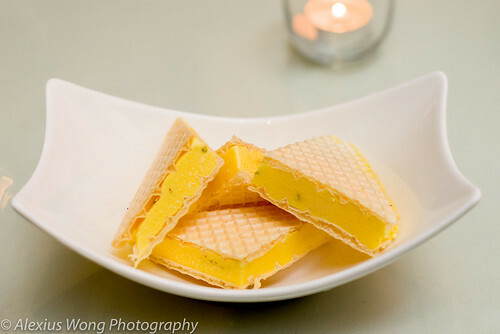 This is definitely my latest gastronomic find, and it quickly ranks high on my personal list. A couple of years ago, I visited a Ghanaian restaurant in my neighborhood that was known for serving authentic fare especially the well-known Fufu dish. However, I was not quite satisfied by the cooking in addition to the long wait for the aforementioned soup dish. 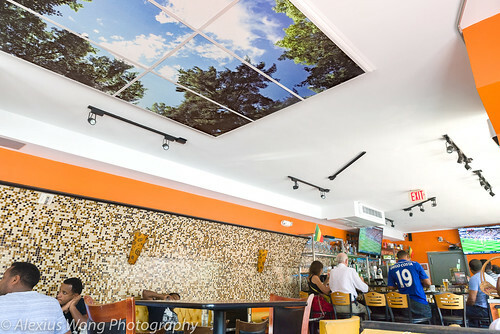 Recently, I came across an online offer to Appioo Bar and Grill located in the U St./Cardozo neighborhood, and judging by what I read on online reviews, I quickly snapped up the offer, and I made a trip to pay it a gastronomic visit last weekend. 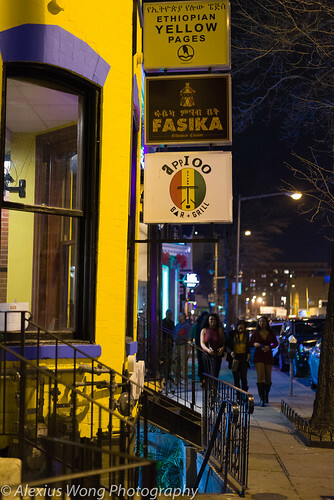 Located on the basement level of a row house on busy 9th street NW, close to the U St. junction, I walked in with a couple whose husband hails from Togo to get some guidance from him on this little-chartered culinary territory. 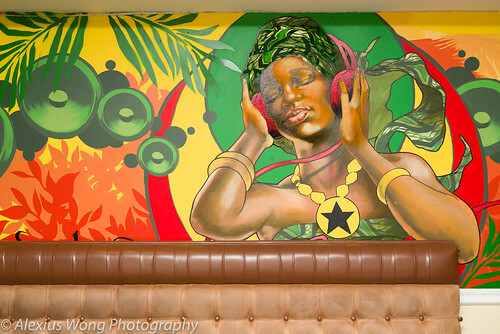 The shotgun space is decorated with a beautiful mural exuding some West African charm with its bright colors and design. Having made a reservation, we took our table next to the long bar that seems to attract quite a local crowd. 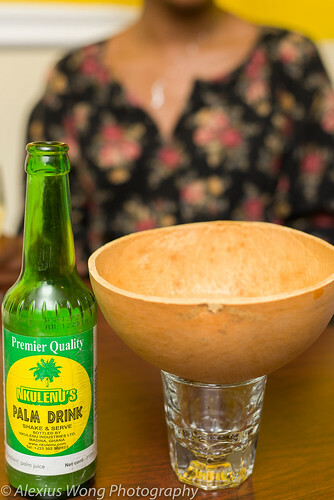 After we placed our orders, my Togolese friend ordered Palm Drink, a typical libation from the Motherland. One sip of it reminded me of the liquor toddy that I had tasted years ago as a child in Southeast Asia. This bowlful, yes, a bowl perhaps made from wood or a gourd, had a unique flavor of sweet with a tinge of sourness from a slight fermentation but devoid of the booze that I remembered this drink is usually associated with. 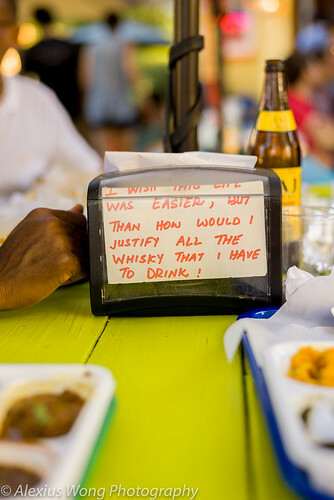 Alcohol or not, it was a good starting thirst-quencher to this visit. 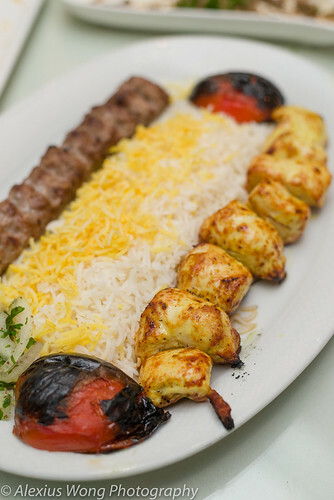 For our first bite, we ordered Goat Kebab or Chinchinga. The sticks came filled to the brim with slices of meat, dark from its cooking, and slightly reddish from a sprinkling of seasoning powder. One bite into it revealed what it was. The goat was slightly tough with a bare hint of gaminess, nothing that belies its true nature. What made it rise above it was the savoriness in the morsels due to a peanut sauce marinade and the spicy powder (called “kebab powder” according to my friend) that created a slightly masochistic tinge that beckoned for more bites. Their tasty nature made for a quick disposal by the diners which created more anticipation at our table. The next appetizer came in soup form. Delicious Pepper Soup is well-known in this culinary tradition and I knew I had to give it a try. A sip from the bowl pointed to a well-cooked broth that hinted of dried fish that I am familiar with, giving the soup some body and flavor interest. The pieces of croaker were very fresh and moist, an indication that the fish was freshly cooked to order. Unfortunately, it was that fresh that it could have jumped into the soup without being scaled. However, I got around it by just removing the skin. There was some good spice bite to the earthy broth, but I was hoping for something that was eye-popping like my grandmother’s pepper soup. All in all, this was still good. 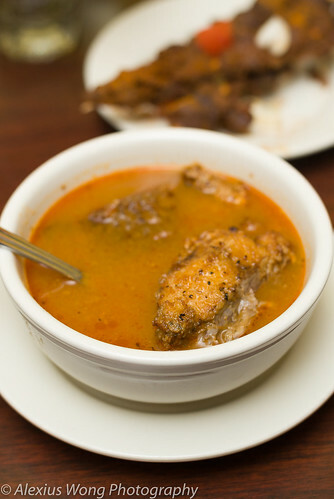 My friend’s order was Goat Fufu in Peanut Butter Soup. It came served in an earthen traditional bowl with a ball of the pounded plantain starch in the middle, sitting in a pool of peanut butter soup studded with pieces of goat meat. 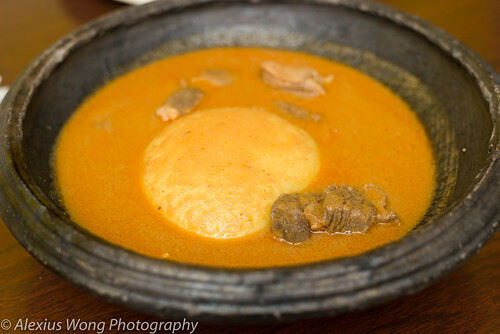 The fufu was the powder form, judging by the lack of starch-stretchiness normally found in the fresh version. But it didn’t detract from the wonderful soup that had a light touch of peanut butter goodness without being overwhelming. The pieces of meat were tender, for goat that is, an indication of a good stewing in the sauce, which made the dish even more appealing. My friend originally didn’t want to order this ubiquitous dish, but at the end of his inhaling it, he was more than satisfied as it hit home for him, and he was about to go into a food coma. 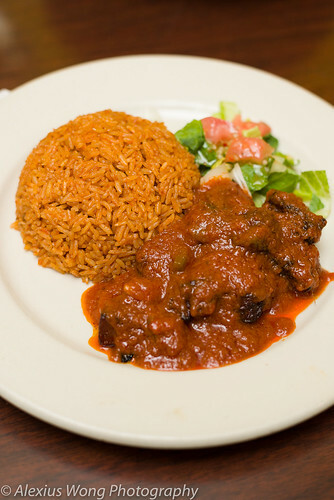 His wife’s order was something lighter and is as equally well-known as the above dish – Jollof Rice with Goat. 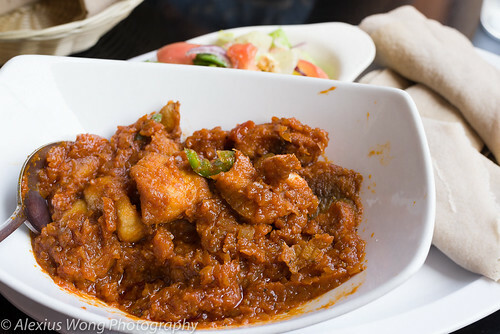 A stab at the pieces of goat pointed to the meat that was initially fried to a slightly crispy exterior then stewed in a tomato-based sauce. I enjoyed the meat texture that was complemented by the sweet-tangy sauce that was aromatic and tasting mild spice-wise. Equally competing for my attention was the rice that was well-seasoned, tasting slightly sweet from the tomato sauce and onions, exuding vegetal notes of sweet peppers, and a note that was root or wood-like. Upon talking to the chef, I found out that he added ginger to the mix. Even though it was still mild, its savoriness made me return repeatedly to the rice elevated from the melange of flavors and cooked to a perfectly light fluffiness. My order of Grilled Tilapia was nixed somewhere down the line. It was forgotten amidst some confusion, and it was quite a wait as the kitchen was trying to make amends. Finally, it arrived whole and grilled, along with a tomato salsa and some spinach as my choice side order. One bite into the fish brought a smile to my face. The skin was crispy and had a slight waft of ginger, perhaps from a rub of ginger juice, and the flesh was incredibly moist and sea-sweet, pointing to its incredible freshness as if just caught from the sea. The belly was filled with a savory grated ginger stuffing that added more perfume to the whole mix. Usually one that is not particularly fond of Tilapia, I was instantaneously attracted to the mild-tasting flesh, devoid of most of its inherent muddiness, and its alluring seasoning. A good partner was the tomato salsa that was really piquant, making it a ying-yang complement to the mild sweet flesh. The spinach mix blew me away with its fresh flavors from the mild-tasting spinach leaves paired with sweet onions, a healthy dose of garlic, sweet peppers, and biting pieces of fresh ginger. There was a note of an unfamiliar spice that confounded me, but the tasty mix constantly beckoned me to go back for more. Undoubtedly, this fish dish was so good that it washed away any trace of my impatient wait, and I couldn’t stop exuding about it. I stopped the chef, as he sheepishly passed by me, to personally thank him for such a wonderfully prepared dish, as he apologized for the dish’s tardiness. All was well here after this scrumptious meal. 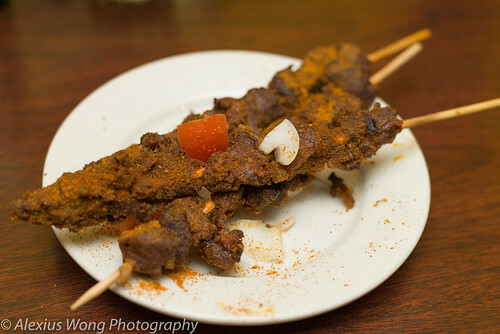 The dishes at Appioo Bar and Grill have given me a fresh perspective on what this Western African cuisine is all about. What impressed me about this visit was the completeness in the seasoning and the savoriness that each morsel or sip possessed, making one unable to resist having more of each dish. Additionally, what impressed me about the kitchen, despite the slight hitch in my order, was a deftly skillful hand that knows proper seasoning, the sourcing fresh ingredients, and that understands balance and ingredient pairing to produce wonderful authentic dishes that would not only satiate those with home-sickness but equally impress all including the novice like me. Yes, the reggae band was overwhelming in this small space (note: eat before 9 p.m. on Saturdays), but ultimately, such impressive cooking spoke volumes above the music. I will be back for more. An urge to watch the latest Pedro Almodóvar film last weekend chimed in at the same time the desire for a nearby place for me to brunch with my friends. My first visit to the Spanish restaurant, Jaleo, was to its mothership branch in the Penn Quarter many moons ago when they first opened, and I was quite impressed with their Tapas fare of which I became familiar with during my year abroad in Spain. This time, the group and I headed to their sister restaurant in the busy Bethesda Row lined with boutique shops and swanky eateries. 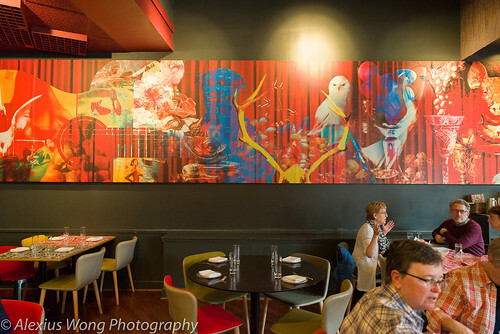 Walking into their festive-looking space, we took our seats and perused the menu, but our attention was quickly drawn to the Restaurant Week 4-course special that was quite a bargain. 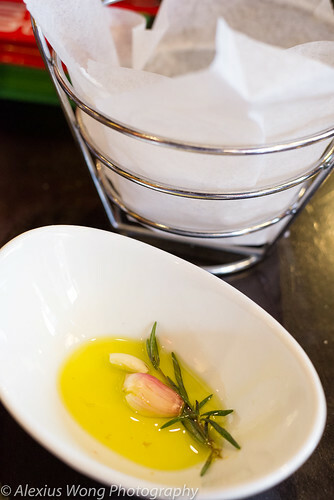 After the whole table agreed to go with the offer, we placed our orders and nibbled on the crusty sourdough bread while dipping it into the grassy fruity olive oil supped up by fresh rosemary with its pine-like essence and a clove of raw garlic lending its slightly acrid bite. 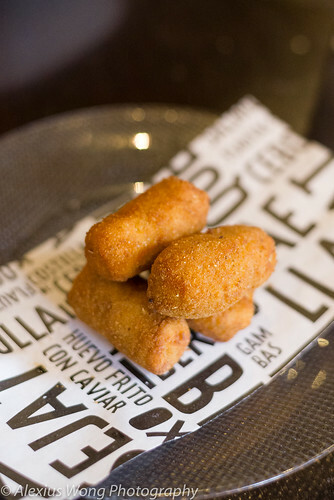 My first course was Croquetas de Pollo. Four of these pillowy bites arrived sitting on some decorative paper that offset these fried batons. One bite sent me back to my college exchange program days in Madrid, Spain, where I would watch with anticipation my house lady preparing these classic Spanish appetizers. These were perfectly fried, with little trace of oil, tasting very clean. Under the crispy exterior was a filling that was extraordinarily smooth, creamy, savory, and meaty from fine strands of chicken. I was glad that the course came with the quartet since they were that good, and a lesser amount would not have sufficed. It was definitely a good start indeed. What arrived next was Empedrat de Mongetes. 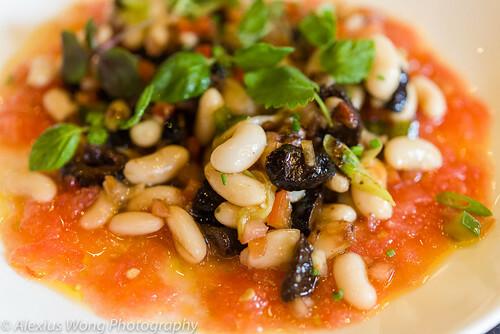 The menu lists the dish as a traditional Catalan bean salad with tomatoes, onion, black olives and sherry dressing. The white beans were perfectly cooked with no chalkiness, the black olives briny and a bit oily but different from the Kalamata kind, all brought together by a dressing consisting of crushed tomatoes, sherry vinegar, and fruity olive oil. The salad reminded me of a good gazpacho from the dressing, made heartier with the vegetable and beans that added the right brininess, body, and a slight crunch from the onion and green pepper bits. Despite being winter, I quite enjoyed this summer dish that was both light and satisfying to the senses. The meat dish was Lomo de Cerdo con Salsa de queso Valdeón. A piece of pork loin sat on strands of onion, topped with a brown sauce and bits of Spanish blue cheese. The pork was a bit tough, having sat a bit too long on the grill, but it was mild tasting and devoid of any extraneous porkiness. What brought more moisture and flavor to the loin was the demi-glace sauce that was thick and rich, tasting of a good reduced stock. The light crumble of blue cheese added the creaminess and the pungent notes that were on the verge of overtaking the dish – thank goodness for the light hand here. The onions were not as sweet and tender as I expected, which would have added a counterpoint to the pungent cheese. Overall, it was quite a good dish, but another note, maybe acid in nature, would have elevated it even further. 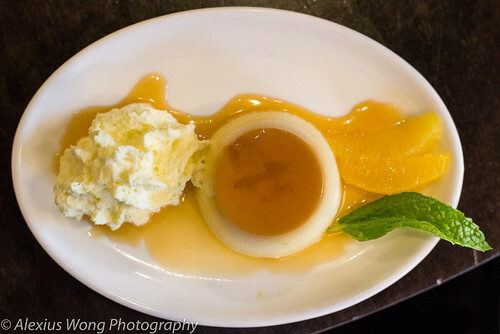 For the final course, I had to go with a Spanish classic dessert – Flan al estilo tradicional de mamá Marisa con espuma de crema Catalana. The title caught my curiosity since it purports to be the chef’s mother’s traditional recipe. The first mouthful revealed it all: creamy, not too dense, silky, and just the right amount sugar in the custard, which was both sumptuous and decadent enough without excess. 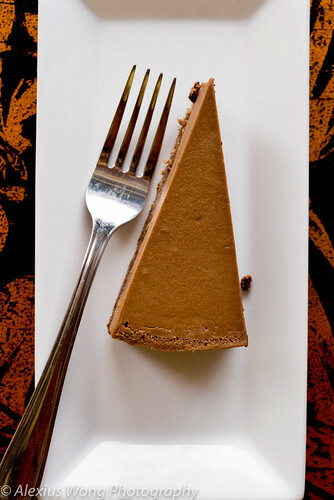 The caramel was not cloyingly sweet with hints of cinnamon, a note that was echoed in the whipped cream thickened with gelatin to give it a pudding-like mouth-feel. 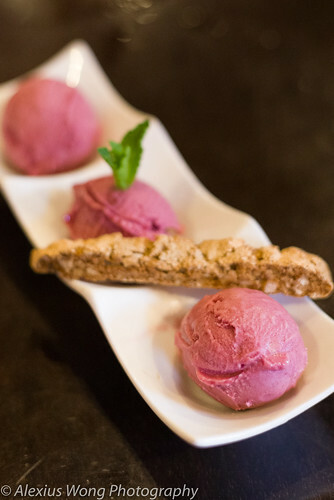 Across from me, I couldn’t help but to ogle at a friend’s trio of fruit sorbet due to its visual appeal. The cold bite was very fruity and not too sweet at all. The biscotti was chockful with crushed almond that complemented the fruit flavors well. Definitely a satisfying and not too sweet happy ending! Jaleo was worth a revisit, and it was long overdue. Despite some timing issues from the kitchen which made for an awkward moment for the diners who had to wait for their main course while another one and I dined on ours, what saved the occasion were the well-executed dishes that were full of flavor and made with quality products, all making a nod to the hallmark cuisine of this establishment without coming across as stodgy and predictable. And at $16 for all four courses, it was quite a steal. I suggest you grab it as soon as you can. Despite a rather tumultuous year, personally, professionally, and politically, I managed to squeeze in some great restaurant finds during my moments of respite. 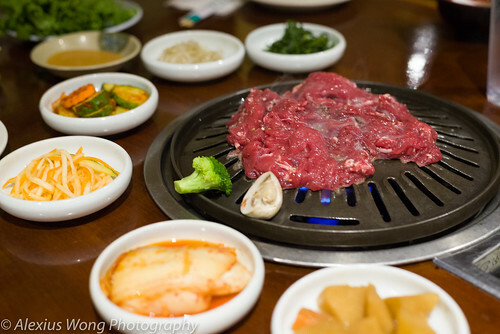 Here is a quick rundown of the top dishes that I sampled throughout the year. Happy New Year 2017! 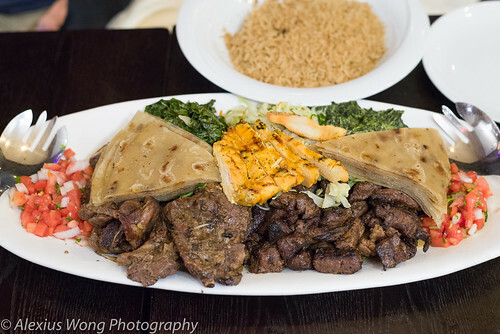 Grilled Goat, Beef, Chicken, Chapati Bread, Collard Greens, Spinach, and Rice Pilaf. Thank you for reading my blogs throughout 2016. Happy Eating in the New Year! The time was right to write another restaurant blog. My cousin was visiting from the other side of the world, literally, with his family and father-in-law in tow. I was tempted to invite them back to my place for some home-cooked food, which I’m sure they would have appreciated, but they couldn’t have fitted into my jalopy with 200,000 miles accrued. So, I decided on meeting them at a Thai restaurant near their hotel that I had heard about. 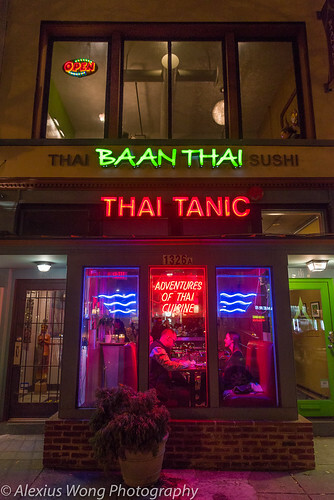 Located on the busy and tourist-laden 14th St. NW corridor, Baan Thai sits on top of another Thai restaurant. 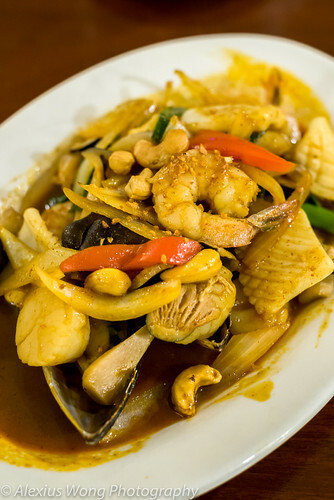 But perusing through its online menu, the dishes hinted of a different direction that most Thai restaurants take with their dishes, a more notably Northern Thai one. So with this in mind, I was looking forward to my taste buds being challenged from their offerings. Walking into the shotgun-style former row house, I was escorted to the floor above the restaurant level, to the bar/lounge area, perhaps used to serve to accommodate the overflow (glad I made a reservation). We quickly honed on a couple of appetizers. 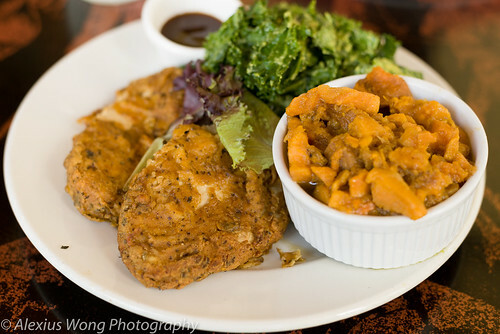 The first was an unfamiliar one to this diner – Pineapple Chicken Bites. The pretty dish arrived with pieces of beautifully carved fruit dressed with cilantro, a curious-looking ball, and a slice of red chili. One bite into it raised my eyebrows. 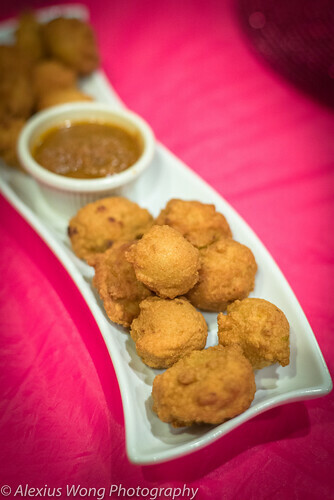 The ball consisted of battered chicken pieces mixed with chopped peanuts and tasting sweet and savory at the same time. The fresh fruitiness of the pineapple echoed the sweetness of the nutty chicken ball and simultaneously added the counterfoil to it. This was an exciting bite to start off the meal. 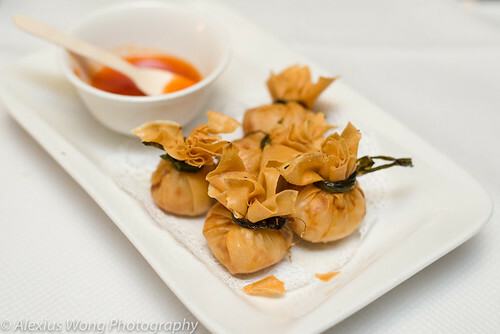 The next small bite was Golden Fried Pockets, also called Money Bags in other Thai joints. The dumplings were well fried and nearly greaseless to the touch. However, the mix, although quite savory, was nothing out of the ordinary and the filling a tad beyond its prime, especially the minced shrimp in the mix exuding a slight off-note. Anyway, it was just ok. Since my folks were in the mood for food to remind them of home, the first main course was Stir-fried Asian Pumpkin with Shrimp. 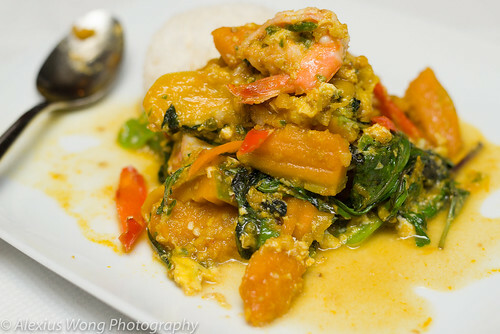 The dish arrived on a plate, rather than a bowl, with pieces of pumpkin, shrimp, and Thai basil, all sitting on a bare pool of sauce. The pumpkin was not too sweet, more a squash kind, cooked perfectly and tasting savory from having absorbed the sauce flavors, and the shrimp was cooked firm, all brought together by the flavorful and slightly sweet light chili garlic sauce. Things were made more interesting by the fragrant Thai basil and the use of slices of red and green chilies, adding more heat and their vegetal notes. My folks and I quite enjoyed this dish, and its quite fiery heat was warming us up in this cold weather. The other main course was a nod to the Northern Thai Eesan region that this restaurant takes its inspiration from – Northern Thai Pork Curry. The first spoonful commanded my attention. 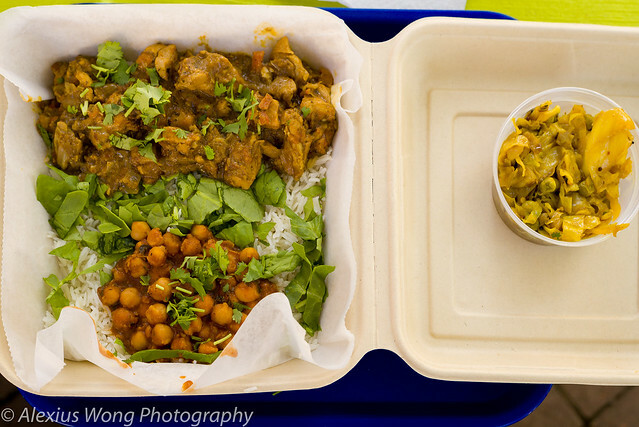 The large meat pieces were fork tender, tasting moist and replete with an unusual “curry” flavors of fragrant root herbs and chili heat. 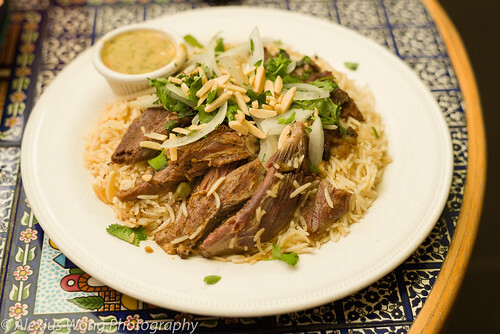 There was no specific spice or herb flavor that stood out, but the sum of it all produced an inviting je-ne-sais-qoui along with its tempting spice heat. I kept digging at the dish as I could not get enough of its unctuousness. To top it off, the pickled garlic and julienne of young ginger added some more bite and complimentary spikes to this dish. A beautiful Eesan dish indeed. My cousin’s father-in-law honed in on another Eesan offering. 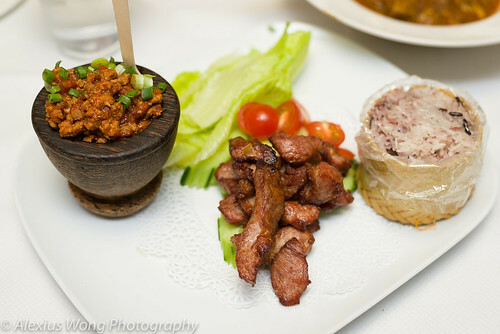 Northern Thailand Pork and Chili Dip was a trio consisting of a mini mortar of minced pork dip, large batons of fried pork, and a traditional Thai basket of steamed sticky rice. The fried pork was quite savory from some seasoning but it was quite dry being it was pieces of loin, I suspect, that was lacking the touch of fat to bring back some moisture to the rather dry bits. This would probably be more appropriate for the North American but not for this Asian who loves a cut like pork belly. The basket of sticky rice was perfectly cooked, albeit lacking any seasoning, but it was the perfect vehicle for the pieces of pork. But it was the pork chili dip that grabbed my attention. It was moist and made alluring by a tinge of sweetness, a blazing heat, and an interesting note that I could only attribute to the dried chili powder used to spice it up. The leaves of lettuce and tomato pieces were the necessary canvas to bring some freshness and relief to this fiery dip, which I kept coming back to. If weren’t for the lean cut of pork in the fried bits, this would have been a home run. Not all dishes consist of curry or meat, and with this in mind, we had a tough time finding a purely vegetable offering on the menu; perhaps this is a trait of Northern Thai cuisine. Eventually we settled on Stir Fried Glass Noodle with Chicken and Shrimp. The plate came with a melange of bean noodles cooked with Napa cabbage, green onions, Chinese greens, eggs, chicken and shrimp. Although the ingredients were well-cooked with a fermented red bean curd sauce, it was a bit too sweet for all diners at the table. 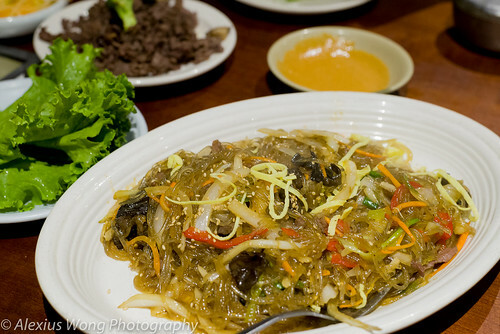 But it provided the necessary relief from the above spicy dishes that were doing a masochistic number on our mouths. 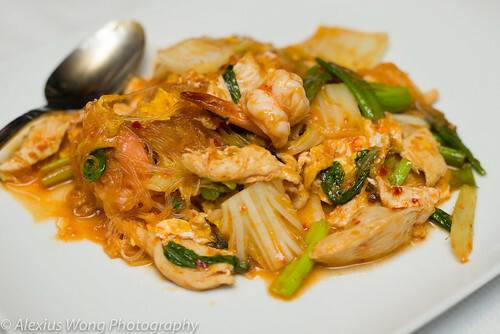 Baan Thai is a breath of fresh air from your usual run-of-the-mill Thai establishment that offers mostly a Bangkok style menu with the usual well-known offerings. What I appreciated here was the unapologetic spiciness and seasoning that whisked the diner to the Northern part of the Southeast Asian country with the authentic offerings like the Pineapple Chicken Bites, the Pumpkin Shrimp, the Pork Curry, and the Northern Thai Pork Chili Dip. The dishes maybe a bit too overwhelming for the average diner, but if you are looking for something challenging yet tasty, beyond the usual Thai offerings, here is the place for your adventurous taste buds.